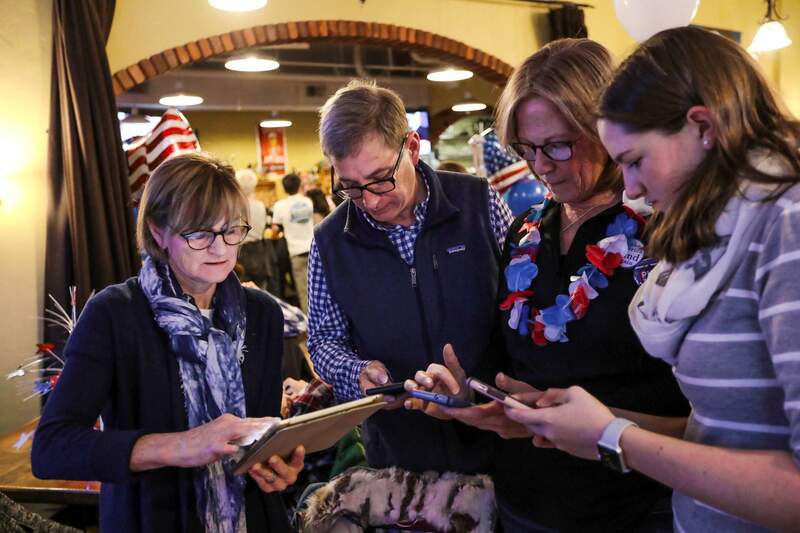 People check election results on their electronic devices Tuesday night at the Eagle County Democratic Party watch party, at Old Edwards Tavern in Edwards. GovernorDemocratic U.S. Rep. Jared Polis defeated Republican state Treasurer Walker Stapleton in the Colorado governor’s race. Secretary of stateDemocrat Jena Griswold defeated Republican incumbent Wayne Williams in Colorado’s secretary of state race. Congressional District 3Colorado Republican Rep. Scott Tipton was re-elected to Congress. Bush argued that Tipton was influenced to energy interests. Tipton argued that Mitsch Bush would kill rural jobs with her environmental proposals, and he tied her to national Democrats. State Senate 6State Sen. Don Coram, a Montrose Republican, defeated Democratic challenger Guinn Unger, a Bayfield Democrat, with 55.13 percent of voters favoring the incumbent and 44.87 percent preferring the challenger, according to partial, unofficial results. The results, reported on the Secretary of State Office’s election results website, come from all seven counties in Senate District 6. In La Plata County, Unger claimed 55 percent of the vote, 15,281 votes, to Coram’s 45 percent, 12,285 votes, according to results from La Plata County Clerk and Recorder’s election website. Senate District 6 covers Archuleta, Dolores, La Plata, Montezuma, Ouray, San Juan and San Miguel counties. State House District 59State Rep. Barbara McLachlan, D-Durango, cruised to victory in House District 59 with 56 percent of voters favoring her and 44 percent backing independent challenger Paul Jones of Gunnison, according to unofficial results from the Colorado Secretary of State’s Office. Results in District 59 reported by the Secretary of State’s election website came from all the district’s counties – La Plata, Archuleta, San Juan, Ouray, Hinsdale and Gunnison. McLachlan said the race was unusual as she faced an independent rather than a Republican. McLachlan, who retired from Durango School District 9-R, touted her strong bipartisan relationship with state Sen. Don Coram, R-Montrose, and state Rep. Marc Catlin, R-Montrose, in representing Southwest Colorado and fighting proposals that would hurt the largely rural 59th House District. She credits her 20 years as a teacher with making her a better listener as a legislator. State treasurerDemocrat Dave Young has defeated Republican Brian Watson to become Colorado’s treasurer. Young is a state representative from Weld County. He’s a member of the Legislature’s powerful Joint Budget Committee, which crafts the annual state budget. Watson championed his entrepreneurial experience as an investor in seeking the post, which oversees state accounts and investments. Attorney generalDemocrat Phil Weiser held 49.7 percent of the vote to Republican George Brauchler’s 47.5 percent, according to results Wednesday morning. Brauchler attempted to lean on his experience to gin up support. He is district attorney in Colorado’s 18th Judicial District and portrayed Weiser as seriously lacking courtroom experience. But Weiser gained a following with his pledges to defend the Affordable Care Act, protect public lands and fight the separation of immigrant families at the border. Weiser is a former University of Colorado Law School dean and former official in the Department of Justice under Presidents Barack Obama and Bill Clinton. Weiser had painted Brauchler as unwilling to defend the rights of Coloradans in the face of Trump’s administration. Proposition 109Proposition 109, which was defeated would have directed the state to raise $3.5 billion in bond for 66 identified highway projects. The bonds would have been paid for with existing state revenues, up to as much as $250 million per year. Its primary backer and funder, to the tune of $635,000, was the Independence Institute, which doesn’t disclose its donors through TRACER. However, SourceWatch claims the institute gets its money from the National Rifle Association and Donors Capital Fund, which is backed in part by Koch Industries. Proposition 109 Proposition 109 would direct the state to raise $3.5 billion in bond for 66 identified highway projects. The bonds would be paid for with existing state revenues, up to as much as $250 million per year. Opponents claimed the measure would require the state to take money from other priorities, such as education and health care, when the state hits another economic downturn. Proposition 110Proposition 110, seen as an alternative to 109, also failed. It would have increased the state sales tax by 6 cents on a $10 purchase, and use those dollars to finance $6 billion of the state’s $9 billion transportation wish list, for about 137 projects. Proponents claimed the measure would create a long-term funding solution for transportation; opponents, including the Independence Institute, say a tax increase is unnecessary. Proposition 110 Proposition 110, seen as an alternative to 109, would increase the state sales tax by 6 cents on a $10 purchase, and use those dollars to finance $6 billion of the state's $9 billion transportation wish list, for about 137 projects. 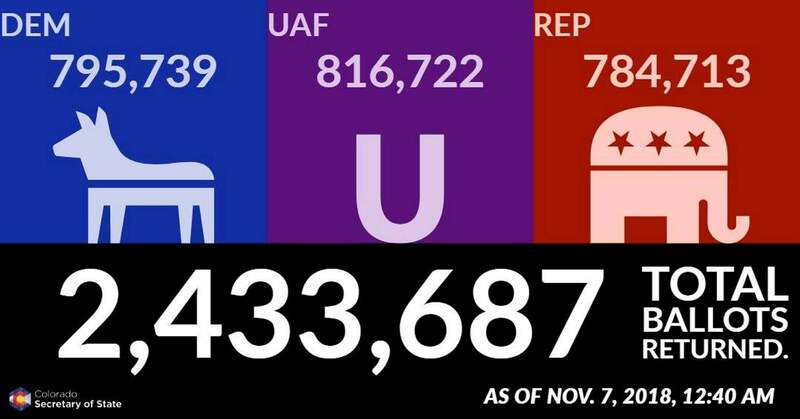 Coloradans for Coloradans raised $7 million to combat Proposition 109 and back Proposition 110. Their donors include the construction and real-estate industries. Prop 112Colorado voters have rejected a proposal that would have tightly restricted where new oil and gas wells could be drilled statewide. Proposition 112 would have required that new wells be at least 2,500 feet from occupied buildings and “vulnerable areas” such as parks, creeks and irrigation canals. It also would have allowed local governments to require even bigger buffer zones. Groups backed by the energy industry pointed to a state analysis that determined the measure would make 85 percent of non-federal land in Colorado off-limits to drilling. Supporters of the measure say the stricter rules will better protect people and the environment. The state currently requires wells be 500 feet (150 meters) from homes and 1,000 feet from schools. Amendment 73Colorado voters have rejected a proposal to raise income tax rates to fund public education. Amendments Y and ZAmendments Y and Z, which both won by big margins, deal with how the state draws its congressional and legislative maps. Currently, the General Assembly draws those maps, which has resulted in court battles in which judges eventually drew the maps, both after the 2000 and 2010 censuses. Amendment Y pertains to drawing of congressional maps. This becomes even more important because Colorado is likely to add an eighth congressional seat after the 2020 census. Amendment Z applies to the state maps for the 35 Senate seats and 65 House seats. Each amendment seeks to set up a committee of a dozen commissioners to redraw the maps. Amendment 74Amendment 74 was not approved. It would have required state or local governments to reimburse property owners when new regulations have the effect of lowering property values. Its public face was the Colorado Farm Bureau but the real power behind it was the oil and gas industry, which put $11 million into the Committee for Colorado’s Shared Heritage. Amendment 74 Amendment 74 would require state or local governments to reimburse property owners when new regulations have the effect of lowering property values. The measure’s proponents were criticized for mailers that falsely claim the Colorado Springs Gazette editorial board still endorses the measure. Amendment 74 was opposed by the Colorado Municipal League, Colorado Counties Inc., Club 20, Action 22, and a host of other civic organizations. A committee formed to oppose the measure, Save Our Neighborhoods, raised $6.5 million, mostly from groups like Conservation Colorado and the League of Conservation Voters.